Medicare For All has become a rallying cry for many (if not most) Democrats. Senator Bernie Sanders started the movement in the last presidential election and introduced his Medicare for All Bill in September 2017 with 13 Senate co-sponsors (including five who have announced their candidacy for President in 2020). The public is embracing the concept as well. Polling is mixed, but as high as 70% of Americans now support Medicare for All (Democrats- 85% and Republicans 52%). Health Care was the top issue in the Mid-Term elections; it is expected to be a dominant issue in 2020 as well. The potential of an overhaul of our health care delivery system is far too complicated (and weighty) to capture in a jingle. I will take four options all affiliated with Medicare for All and provide a bit of detail on each. Unlike a socialist health care system (for example the United Kingdom), in this plan doctors, hospitals and other health care providers will remain independent– the government will pay for care but not provide it. Paying for this version of Medicare For All is controversial and has incited debate. It will at least partially be paid for by multiple new taxes in the bill, such as a tax on households earning more than $28,800, (escalating for those with yearly earnings over $250,000), as well as taxes on capital gains and dividends, and a new “Responsible Estate Tax” on Americans inheriting more than $3.5 million. The tax on employers under Bernie’s bill is 6.2% of their employees’ incomes. As helpful as those revenues may be, the biggest argument against Senator Sanders’ plan is the predicted cost. Senator Sanders estimates a $1.38 trillion per year expenditure, other calculations range from $2.4 trillion to $2.8 trillion- and a report last July by the Mercatus Center at George Mason University placed the cost at a staggering at $3.26 trillion annually. (These are all estimates- for a real-life example of how expensive Single-Payer health care can be, see the Vermont example in “Want to Know More,” below). Cost is a significant barrier, but there are other reasons not everyone is endorsing the Bernie Sanders plan. A federal government take-over of health care raises questions about federalism, and there are a lot of people that like the insurance they currently have– such as people with generous employment benefits. The eradication of the health insurance industry would hit small-town insurance brokers on “Main Street, Everywhere” and devastate insurance centers like Hartford, Ct. Finally, this plan will destroy much of the structure created by the Affordable Care Act, when support for the law is at an all-time high. *Although I am focusing on the Bernie Sanders’ Bill- in March an even more ambitious plan for Medicare For All- HR676– was introduced by 124 Progressive Democratic Representatives in the House. The bill makes health insurance illegal as well as any for-profit health institution. I wrote about the Public Option in detail in Fontenotes No. 25. As a brief recap, this version of “Medicare for All” would not extend government-backed health care coverage to everyone but would make a Medicare-like product available for purchase by individuals on the Obamacare Marketplaces (also called “Exchanges”). Presumably, this would help to control costs within the pool of available policies and could help bring insurance costs down across the industry. This idea- individuals choosing to buy-in to Medicare, was born (and died) in California in 2001. Presidential candidate John Edwards revived the idea in 2008; candidates Obama and Clinton adopted similar proposals in their campaigns that year. 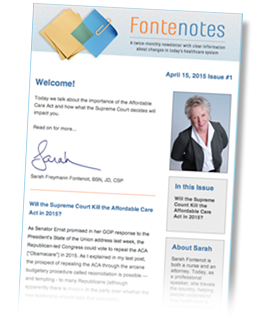 As President Obama and Congress moved forward writing the Affordable Care Act [“Obamacare”], the Public Option remained part of the design, but increasingly it became controversial as private insurance companies argued they could not compete in the market with a government-backed alternative. Democrats ultimately killed the Public Option; the final blow came from Senator Joe Lieberman (why? hint: where is the Insurance Capital of America?). Hillary Clinton raised the Public Option from the ashes as part of her 2016 Presidential Platform. Now, as we face the Presidential election cycle of 2020 the Public Option has resurfaced again, but under the rubric Medicare for All. The persistence of this idea was predicted in 2010; that tenacity may point to its value. The Public Option does not require destroying the private insurance industry, people can keep the insurance they like, and the structure of our providers (profit and not-for-profit) remain the same- there is no immediate government takeover of health care. The only downfall may be the threat the Public Option poses to the private insurance industry- but that would seem to prove the point. Could the Public Option ultimately lead to a single-payer government-run health care system? Yes- but over time and only if the insurance industry fails to adapt. There are some in D.C. with a much smaller expansion of Medicare in mind- simply lowering the age of eligibility to 50 (or 55). Private insurance companies charge more to cover those who fall in the 50 – 64 age range (known as the “age tax”). Arguments for allowing people as young as 50 into Medicare include the prevention of health conditions that could cost the government more in the long run if untreated until 65, and the business opportunity for private insurance companies offering Medicare Advantage plans to this segment of the population. The reason to not expand Medicare is, of course, the cost to American taxpayers. And as another wrinkle- some Democrats want Medicare for All to be a choice each state makes- to have state-run single-payer plans. These proponents should consider Vermont (see Want to Know More, below). Conclusion: How Do Any of These Options Compare with What Voters Envision? It is possible that none of the options I described match the expectation of Americans marching under the Medicare for All banner. Based on promises from politicians, talking heads, and 30-second sound-bites, the vision of many Americans appears to be a health care system even more glorious than any under consideration in Washington. The prospect of obtaining all the care they need, from any provider, without permission from an insurance company, and at no cost is a clarion call for voters. 1.The estimates of the cost of Bernie Sanders’ version of Medicare for All vary significantly and are only projections. A real-life example of a similar project comes from Bernie’s own state of Vermont. Vermont started trying to achieve a state-specific single-payer health care system from (at least) 2005. With great fanfare, “Green Mountain Care” was passed by Vermont voters in 2011. Described by Forbes as “an unmitigated failure,” Vermont abandoned this single-payer plan in 2014 before it was ever implemented. Reasons cited include the insistence on the public on “platinum-plated insurance coverage,” opposition from hospitals and physicians who would have to accept Medicare-level reimbursement for all their patients, and failure of political will to do what was required to make the plan work (including implementation of the necessary 160% tax increase to cover the program). 2. The confusion around a single-payer health care system matches misunderstanding many people still have about the Affordable Care Act [Obamacare]. Here is a helpful chart from Physicians for a National Health Program [PNHP] that compares the two.